Anna Atkinson is a multi-intrumentalist, singer and songwriter. She is most frequently heard playing violin, viola and accordion. In 2008 she graduated from the University of Victoria, after studying with the department of music. Currently Anna can be seen performing as part of the Musical Brunches at Rundles concert series. Rundles is one of Stratford’s finest restaurants. The intimate concerts run every Saturday and Sunday until August 24. 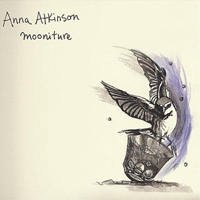 In June 2011, Atkinson released Mooniture, her critically acclaimed debut CD recorded with producer Brent Bodrug. It was featured on the Toronto Star’s Anti-Hit List, and continues to receive frequent play on CBC radio. Anna grew up in a musical family. Her father is a self-taught banjo and guitarist. He is one of the founding members of the Folk Music Society in Windsor, On. Check out episodes that also mention Musical Theatre, Stratford Festival, University of Victoria.